- Connect a jumper cable from the LNB/LNBF to the "TO LNB" connection on the Satellite Finder,Connect the cable from your satellite receiver to the "TO REC" input on the Satellite Finder. - Make sure your satellite receiver is on . The Satellite Finder's scale should be lighted at this time and the meter reading should be around 2. - Set your dish to the proper azimuth and elevation settings, (This information should be supplied with your dish)Set the Satellite Finder's scale reading to about 5 by adjusting the level control found on the face of the Satellite Finder(Turning the knob clockwise will increase the reading). - Peak the signal by slowly moving the azimuth and elevation of your dish. 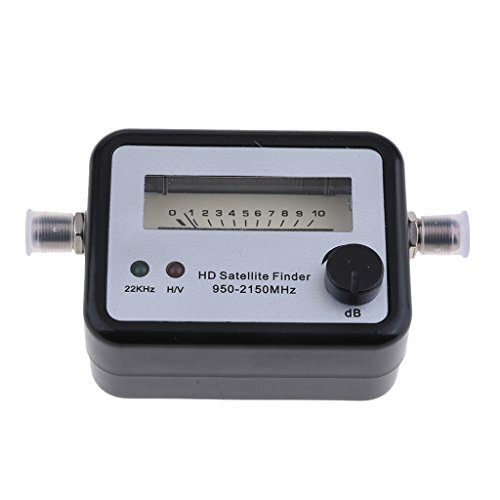 If the Satellite Finder's reading becomes full scale, adjust the level control knob to reduce the reading to around 5(Turning the knob counterclockwise will decrease the reading) . - Continueto move the dish until you have the highest possible meter reading. When connecting to a LNBF with gain higher than 65dB, insert a 5dB attenuator between the meter and the LNBF. If a attenuator is not available you may use a long coax (60 feet or more) between the meter and the LNBF. If the meter needle is jumping the sensitivity is too high. Be very careful not to damage the adjustment by turning it too far or too hard. Connect a jumper cable from the LNB/LNBF to the "TO LNB" connection on the Satellite Finder,Connect the cable from your satellite receiver to the "TO REC" input on the Satellite Finder. Make sure your satellite receiver is on . The Satellite Finder's scale should be lighted at this time and the meter reading should be around 2. Set your dish to the proper azimuth and elevation settings, (This information should be supplied with your dish)Set the Satellite Finder's scale reading to about 5 by adjusting the level control found on the face of the Satellite Finder(Turning the knob clockwise will increase the reading). Peak the signal by slowly moving the azimuth and elevation of your dish. If the Satellite Finder's reading becomes full scale, adjust the level control knob to reduce the reading to around 5(Turning the knob counterclockwise will decrease the reading) . Continueto move the dish until you have the highest possible meter reading,Remove the jumper cable and Satellite Finder and reconnect the LNB/LNBF to your receiver.